THREE popular community parks across the Gwydir Shire will get a pay-time boost for improved playtime for youngsters with $50,000 in funding from the State Government, announced by Northern Tablelands MP Adam Marshall. 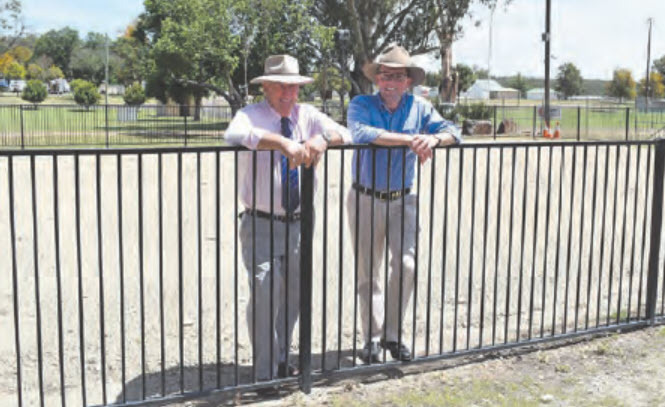 Gwydir Shire Councillor David Coulton, left, with Northern Tablelands MP Adam Marshall at Warialda’s Captain Cook Park, which is about to undergo a major upgrade. Captain Cook Park in Warialda and Cunningham Park and CWA Park in Bingara will share in the funding windfall to upgrade play equipment and facilities at the three locations. “The three parks are very popular with locals and visitors for play and family outings and these funds will significantly improve the playgrounds,” Mr Marshall said. Gwydir Shire Councillor David Coulton said Captain Cook Park would be upgraded with the erection of shade sails there so families and children could better enjoy it during summer months. “Captain Cook is the main park and it gets used a lot; for kids’ birthday parties and for family barbecues and get-togethers,” Cr Coulton said. “The shade sails to go over the top of some new play equipment will make it more summer-friendly.” Cr Coulton said the project would be boosted as well by donations and contributions from the local Rotary club and a mothers’ group, which would see new playground equipment installed there to capitalise on the upgrade. Gwydir Shire Council will manage and organise the works for the three playgrounds and hopes to get those underway soon with two shade sails measuring 8 metres by 6 metres to go into Captain Cook and two sails spanning 8.5 metres by 10 metres set for Cunningham Park. Council’s town utilities and plant manager Andrew Cooper said Cunningham Park in Bingara would also get some big new shade sails. “The park is near the swimming pool and between the two bridges and it’s a pretty popular place with play and exercise equipment,” Mr Cooper said. “The NSW Stronger Country Communities Fund grant will also allow us to put some perimeter fencing in at CWA Park, to make it safer for users.” Mr Marshall said CWA Park was next to Gwydir Oval and close to major traffic ways, so the 70 metres of fencing around the playground would provide an increased safety barrier from the adjacent road.